So am back and have been thinking about what's been going on around me and I said to myself, not everything is gonna work out for me, so what do I do when these things don’t work out for me? Am pretty sure you have walked into a store or even at the market and when you pick up an item and it don’t feel right with you_ you pick up another that suits your test right? it could even be a clothing, you see it and it didn’t fit on, you exchange it for the right one that fits perfect. That is how you exchange things that don’t work for you to things that work better for you. Now this same principle applies to your thinking. 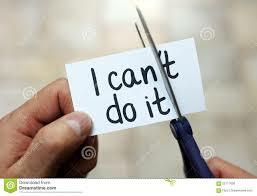 If you will exchange your " i cants" for "I can" thoughts and begin to say i can do whatever I wanna do in life because \God strengthens me, you see remarkable changes begin to happen. If you build into your character the thought that with God's help, you are able to do whatsoever you need to do in your life, you will have more zeal and enthusiasm about facing every day. Thinking about it YOU EVEN HAVE MORE PHYSICAL ENERGY WHEN YOU THINK I CAN THOUGHTS, it helps to not dread anything that is an energy drainer. it is never too late to begin to say "I can" don’t think or say things like am to deep into this mess I can’t get out, or I can’t leave because of its a packed up problem after another or I can’t enjoy my life because of my personal problems. Yes I know some problems we face might be difficult but know that God can’t allow you into a situation he knows you can’t handle (see 1 Corinthians 10:13). That means we go through them with a good attitude! And you have to believe God helps you if you ask him to. For the devil may provide one of those flashing thoughts " you don't deserve Gods help so don’t border asking" but you can remind him God doesn’t help us because we deserve it, but because he is a good God. 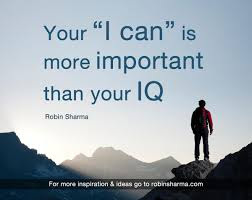 I challenge and encourage you right now to constantly believe you are able to do anything that comes your way with the help of God, and remember you can only have a good attitude towards things when you exchange your "I can’t" for "I can". 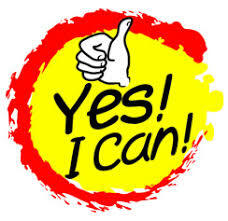 Think about it: what "I can’t" belief in your life do you need to change for an "I can?